Mood problems, including depression and bipolar disorders, are no laughing matter. More than 20 million American adults have a mood disorder and 40 million an anxiety disorder. And these numbers don't include the average worrywart or person who suffers an occasional bout of the blues. YouthBerry is here to help! 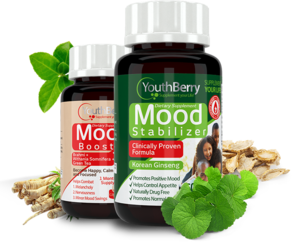 YouthBerry’s Mood Booster has a Brahmi, Withania Somnifera &amp;amp; Green Tea Extract enhanced with our proprietary blend of vitamins and minerals. These supplements help you stay happy and calm. 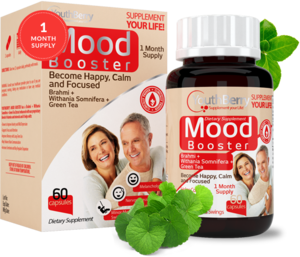 Mood Booster combats melancholy, nervousness and minor mood swings. 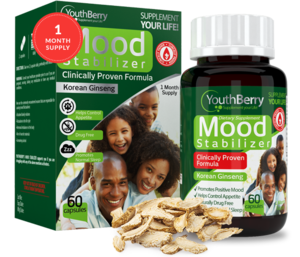 YouthBerry’s Mood Stabilizer is formulated using Korean Ginseng. The natural herb extract promotes positive mood and normal sleep. It is ideal for individuals who consume alcohol, use narcotic substances, disturbed family relations as well as fluctuations in the lifestyle and hormonal imbalances in the body.